The longest day of the year is upon us! How fast did that go… Make the most of the Summer with our tips for this week. This Friday, London is getting its very own Japan House, a brand new cultural destination to the UK, providing visitors with authentic and surprising encounters with the very best in Japanese art, design, gastronomy, innovation and technology. Japan House London, the first and only Japan House in Europe after projects in Sao Paulo and Los Angeles, is revitalising an Art Deco building on Kensington High Street and will feature a rolling roster of exhibitions from esteemed Japanese artists. Spread over three floors, the building will also house a contemporary Japanese restaurant AKIRA from esteemed chef Akira Shimizu as well as a retail offering from some of Japan’s most talented artisans. Japan House London will open on Friday 22 June at 101-111 Kensington High St, Kensington, London W8 5SA. Maybe not the most dramatic story on paper, David Hare’s play about the birth of Glyndebourne Opera is in fact a tender and intelligent story of love – love for music, vision and bravery that transcends borders, animosities, creative differences, wars, class and prejudice. The beating heart of the story is visionary John Christie’s deep devotion to his wife, the soprano Audrey Mildmay, a touching and human portrayal of a marriage that radiates beauty in its happy and unhappy moments. The Moderate Soprano is beautifully acted, beautifully designed, set in stunningly stylish art deco salons that make you yearn for yesteryear and it celebrates a certain kind of jovial English upper class chap that is charming and egocentric in equal measure and seems to be a dying breed these days. 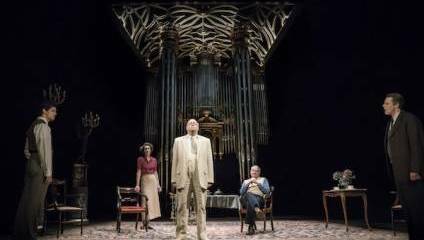 The Moderate Soprano is at the Duke of York’s Theatre until 30 June. Established in 1993, Southbank Centre’s Meltdown is the longest running artist-curated music festival in the UK. It has an unparalleled reputation among artists and is famed for providing a stage for exclusive collaborations and intimate, once-in-a-lifetime musical experiences for diverse audiences. Marking its 25th anniversary, this years Meltdown will be curated by Robert Smith, lead singer, guitarist, lyricist and principal songwriter of The Cure, who follows in the footsteps of previous legendary curating artists such as David Bowie, Nick Cave, Patti Smith and Yoko Ono. For this jubilee year, Robert Smith has hand-picked some of his favourite bands to perform, bringing together trailblazers and pioneers from a variety of genres and across the globe, from indie, pop, glam, industrial, shoegaze, post-rock, electro, metal and beyond. The line-up promises rare live performances and one-off shows from stadium and arena acts such as Placebo, Deftones, Death Cab for Cutie, The Libertines, Manic Street Preachers, My Bloody Valentine, Nine Inch Nails and an exclusive intimate show from Robert Smith himself. Eight former railway arches next to the famous Graffiti Tunnel in Waterloo have been brought back to life to provide a collection of independent bars, restaurants and entertainment spaces that celebrate urban culture and are now open for the public. Leake Street was made famous in 2008, when street artist Banksy came across the abandoned road tunnel that was previously used by taxis to queue for passengers. Banksy saw the potential of the dark, damp space and organised an event for graffiti artists from around the world to transform the tunnel into “an oasis of beautiful art”. The Cans Festival attracted thousands of people, international press coverage and put Leake Street on the map as a democratic cultural venue for street art. These days the tunnel is probably most famous as home of the Vaults. Leake Street Arches will soon be home to eight new independent businesses. A new Banh Bao Brothers restaurant, Draughts, Aures London and Rat Bar are already open. Leak Street Arches are located underneath Waterloo Station. The 21 June, also known as midsummer, famously marks the longest day of the year. Traditionally people would have flocked to historical sites such as Stonehenge. This year for the first time, the London Eye will be opening especially for the summer solstice, giving people the opportunity to see the sun rise from 443ft above the heart of the city, climbing up above the iconic skyline, slowly shining over the palaces and skyscrapers. Summer Solstice is said to have an invigorating effect on the planet, seen by many as an opportunity to reconnect with both your body and mind, so after watching a peaceful sunrise from up in the skies, channel the positive healing energy and participate in a one-off 30-minute mindfulness class from the London based triyoga studio. Summer Solstice Tickets for the London Eye are £35 and can be booked here.